Upper Deck Blog has only been running for about a week now, but as soon as we launched, I made sure to mentally circle April 15th. I doubt I can do this day justice, but I’ll try my best. Today marks the 62nd anniversary of Jackie Robinson taking his spot at first base at Ebbets Field on April 15th, 1947, shattering baseball’s color barrier. Sixteen years before Dr. Martin Luther King’s “I Have a Dream” speech, Jackie pushed the sport and our country forward, far ahead of his time. Looking at Mr. Robinson’s history, it’s amazing that someone could achieve so much good in so little time. We only had him with us for 53 years, but he accomplished a great deal in so many aspects of his life (most removed from the baseball diamond). His most famous quote, “A life is not important except in the impact it has on other lives” is inspirational, and at least from my perspective, slightly intimidating. The concept of your life having no meaning unless you influence other people for the better is a hard one to wrap your brain around, for sure. Grew up in a poor family. Was the first athlete in UCLA history to letter in four sports: baseball, basketball, football and track. Entered the military only to be court marshaled for refusing to move to the back of an Army bus. Broke the color barrier in baseball, on a deal with Branch Rickey that for the first three years, he would have to absorb all insults and threats thrown his way, without reacting angrily. Absorbed insults from players and fans alike, along with death threats. Despite this, he managed to still perform on the field at the highest level, while keeping his cool and not retaliating. Became the first black commentator on ABC’s Major League Baseball Game of the Week. Became the first black player to be inducted into the Baseball Hall of Fame. Became the first black person to be Vice President of a major American corporation. Founded the Jackie Robinson Construction Company to build housing for families with low incomes. Once you look at all these accomplishments and the impact they had on others, Mr. Robinson’s famous quote suddenly carries more meaning. “A life is not important except in the impact it has on other lives” serves as both a proverb and a challenge, with Jackie’s example leading the way for inspiration. My personal favorite Jackie Robinson moment is Game 2 of the 1972 World Series, where he was honored for the 25th Anniversary of breaking the color barrier. Rather than take the moment to bask in his own glory, Mr. Robinson expressed his wish to see a black manager in Major League Baseball. He would die but ten days later, but his wish would come true in 1975, when Frank Robinson became the manager of the Cleveland Indians. Before this starts to sound too much like a middle school history report, I’ll point out that Jackie Robinson was good at baseball. Damn good. It’s often overlooked, given his other social accomplishments, but the guy could play. Stories of how he could control the pace of a game just by his presence on the basepaths are legendary; the pitcher would get distracted, Jackie would steal second, third, even home with equal parts precision and raw athletic ability. Mr. Robinson won a Rookie of the Year award, an MVP award, was a six-time All Star, and won a World Series with the beloved 1955 Brooklyn Dodgers. He had a lifetime batting average of .311, with an on base percentage of .409, both phenomenal stats for his career. Consider that he only came to the majors at age 28, and you can only wonder what else he would have accomplished had he been let in earlier. Then again, it was his impact that allowed others to follow in his footsteps, having full, complete careers thanks to his efforts. It was too late for the likes of Josh Gibson or Satchel Paige (who did get to finally play in the majors at age 42, sadly we missed many prime years of his talent), but Jackie ensured future players would have that opportunity. Fast forward to the modern era, and Jackie Robinson’s #42 is retired across all of Major League Baseball. Every park you go to, from Dodger Stadium to CitiField (and everywhere in between), players cannot wear his number, in tribute (Mariano Rivera is the one active exception, as his 42 was grandfathered in). Today, all players will wear 42 to celebrate Jackie’s memory. A lot has been said about this issue, as players, sportswriters and fans alike wonder if having everyone wear it cheapens the significance. 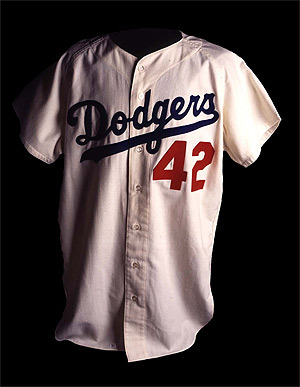 From my own personal point of view, I can say that despite being a huge Jackie Robinson fan (in case you couldn’t tell), I won’t wear a replica Dodgers 42 jersey. Can’t do it. I feel the weight and significance of what that symbolizes is too much to bear, and that it takes a special person who has “earned” the right to don that number. On a personal level, it feels like something sacred. If it was up to me, I’d ask each team to pick one player or coach who they feel has earned the right to have the honor of wearing Jackie’s number on this day. That being said, I don’t think it’s something to get too hung up on. Today means far more than the numbers being worn by the players, and if a kid asks, “Why are all the players wearing 42 today?”, it serves a great reminder that leads to nothing but good and inspiration for the next generation. 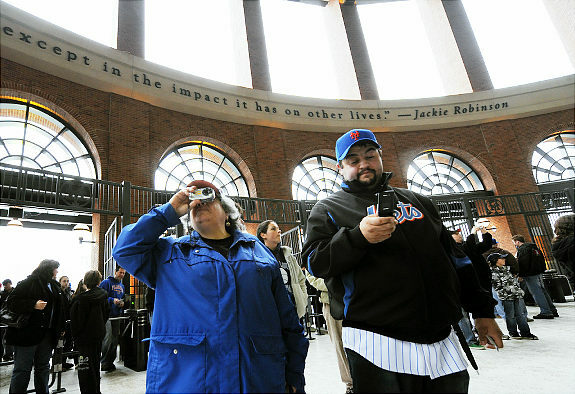 On the subject of carrying on Mr. Robinson’s legacy, the Jackie Robinson Rotunda was dedicated at the new CitiField today. Jackie’s widow Rachel Robinson, Governor Paterson, and Senator Schumer were among those in attendance. 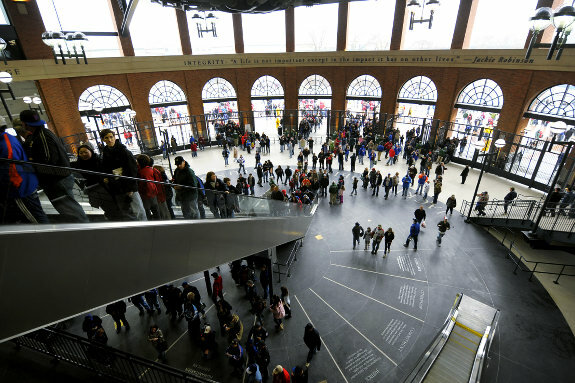 The Rotunda will be the first part of the stadium you walk through before getting to the field itself, and is a fantastic tribute to Jackie and his life. 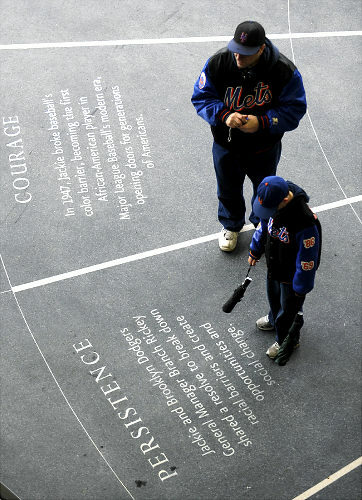 I think of how important that “first baseball game” memory is for any child in America, and now for millions of kids, it’ll be, “I walked through the Jackie Robinson Rotunda and learned about who he was, and what he did.” I don’t mind telling you, I can’t get enough of the picture above, showing this unfolding before our eyes. On a personal level, I know it’ll be a reminder of the more important things in life, before and after each game I attend back home.